This is one of our new favorite recipes. I make this at least every other week. We like to eat it like lettuce wraps with brown rice, fresh bean sprouts, sliced scallions & julienned cucumbers, & wedges of lime. And the best part is that we get to eat "exotic" food made with traditional ingredients that come from the pantry! Mix all the ingredients above & marinade the chicken for 30 min. Then you can broil them for 8 min. (flipping once), or grill them. Serve with peanut sauce. **If you don't like spicy food, just reduce (or omit) the Tabasco. 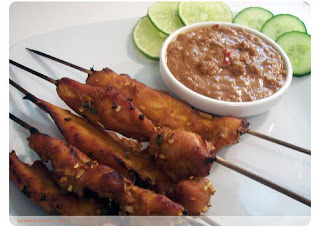 I just love the peanut butter and lime flavors together in the dipping sauce, which yours has too. What a great idea to eat them in lettuce wraps! I'll try that. Thanks for the recipe. Holy cow, we had this tonight and it was a huge hit! So so so delicious!